Our museum grade photo studio is the ideal place to document a surfboard. 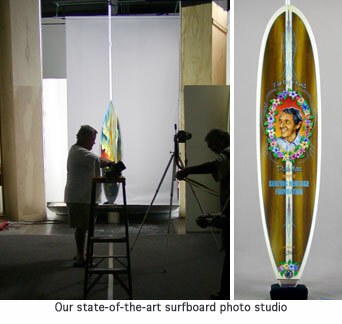 With two 16-foot-tall lightboxes, the soft lighting clearly shows the curvature of the rails and also the rocker of the board, while minimizing the glare normally associated with shooting a surfboard's shiny surface. Designed by legendary surf photographer Art Brewer, this state-of-the-art facility has been used for thousands of photographs by both surfboard collectors and shapers. Rent the SHF photo studio and bring your own camera or hire our in-house photographers to handle the shoot for you. We use Hasselblad cameras and scanners to capture details not currently available with 35mm digital cameras. With either option, we offer half and full day rates. Please contact us for availability and details, or call 949.388.0313 x5.